“Kelos, called the long-finger, was once a young bonesinger from the Milantos craftworld. He worked diligently at his chosen path, but unexpectedly began to develop a psychic foresight and precognitive ability that terrified the Farseers of Milantos. The reason for this fear was that Kelos only ever foresaw one event – the total destruction of his craftworld and the death of his kin. Kelos tried to convince the counsel of the validity of these visions, for he was certain that they were a true-sight, but these disturbing lines of fate were undetected by the Seer counsel and they began to view Kelos as an abhorrence. The taint of Chaos was suspected, and he was banished from his world by the counsel. 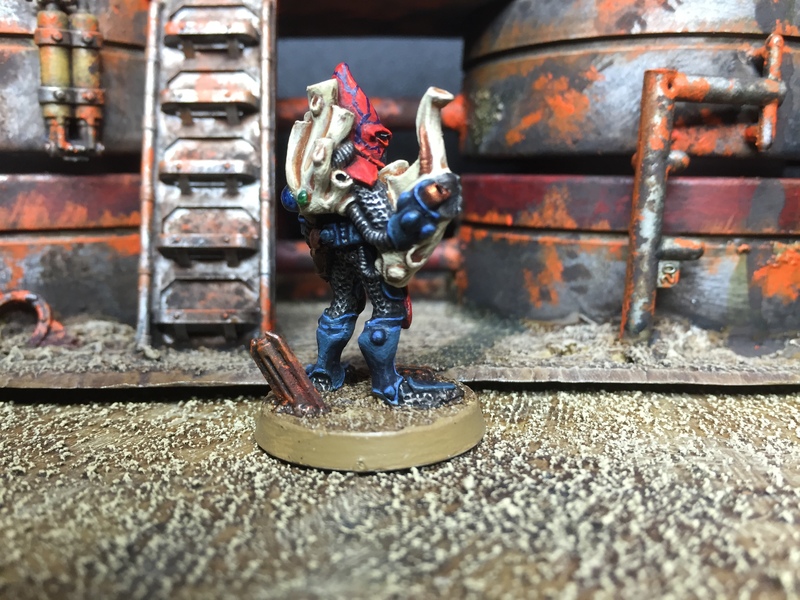 Alone and afraid, Kelos began to wander the stars while his kin thought themselves wise and safe… Weeks later, the craftworld Milantos was overrun by the minions of Slaanesh, its people destroyed, their souls consumed by She Who Thirsts. 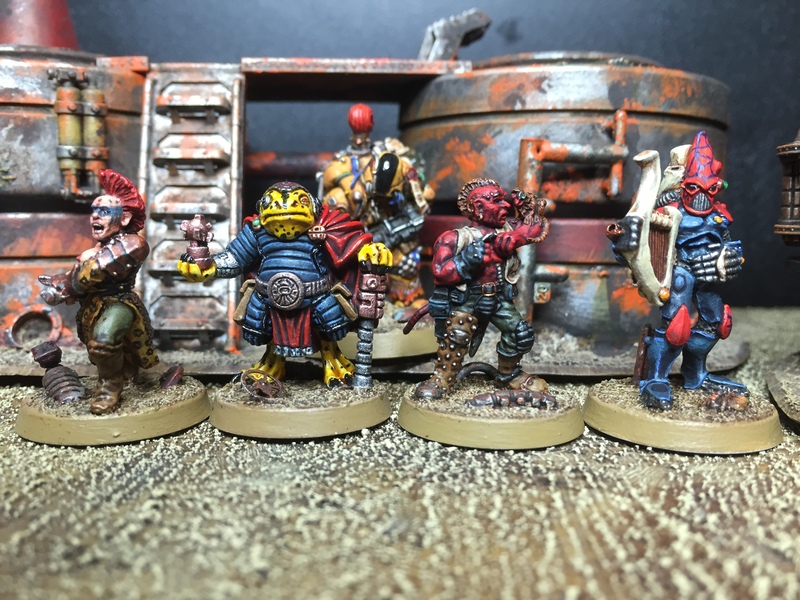 Phew, another RogueQuester in the bag, and another member of Arturo’s growing band of misfits… I hope that the next one is more enjoyable to paint! He’s looking solid – maybe not quite on the standard of the rest of the crew (especially that stylish looking Slaan) – but that’s the fault of the sculpt rather than your efforts. Plus he gets big points just for being a bard in the 40k universe! He works well with the rest of the group but I get the feeling they don’t warm to either just like your good self. I kind of feel sorry for him. He’s alone even though he’s part of a group haha. I think your paint job is fantastic I just don’t like the Eldar. Out of interest, who is your favourite so far? Barbarian is my favourite too. I look forward to seeing the others. Are you doing one a week? Damn, you’re poving faster than we are ! I like hime a lot, I also considered using this model but wanted to use models I had only so left teh bard aside, cool to see you managed to pick it ! I see you master the age old skill of devising a new Craftworld only to see it destroyed. Epic! I would have it take centuries not weeks before the foresight came true. 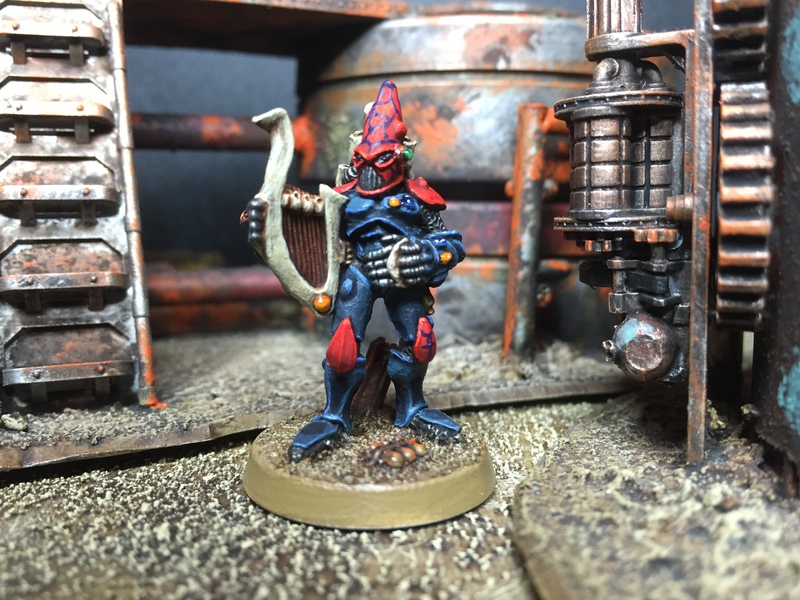 Weeks are after all mere blinks of an Eye for an Eldar. 😅 Thanks for the kind words Charles, and welcome! 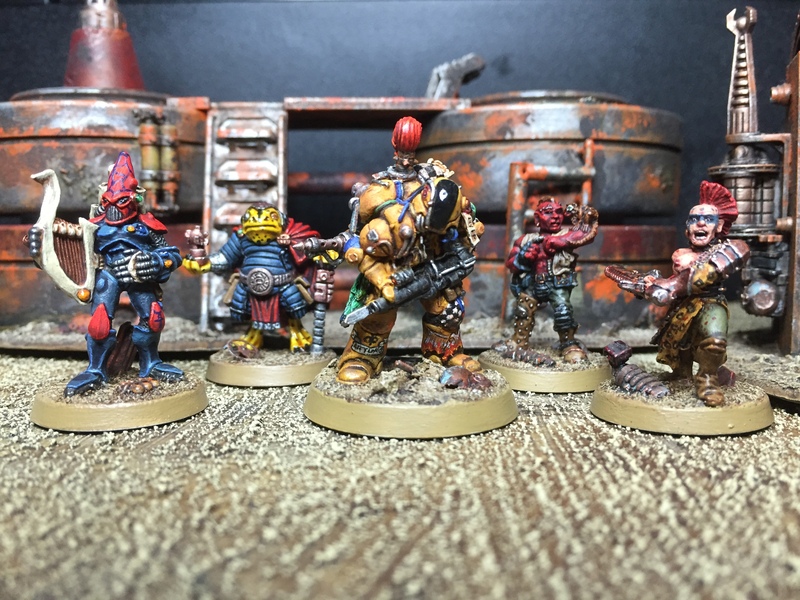 Kelos looks great – the kind of model that really encapsulates so much about early Rogue Trader, and complimented perfectly by the paint scheme that you applied to him. I look forward to the next member of the party!